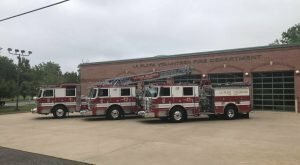 The La Plata Volunteer Fire Department provides fire and emergency medical services to residents, businesses and visitors of the Charles County Area. We provide mutual aid to our neighboring departments and counties. We respond to all emergency situations including all aspects and measures related to the prevention, detection, control and extinguishment of fires, hazardous material and emergency medical responses. We are located 30 miles south of Washington, D.C.
La Plata Volunteer Fire Department, Inc.
1) If an adult bites you, it’s possible you’d only get a dry bite. But go to the hospital as soon as possible anyway. 2) if you smell cucumber for no reason, you are within striking distance of a copperhead and you have already disturbed him. 3) Juveniles often have a yellow tip on the tail and they ALWAYS DUMP ALL THEIR VENOM . 4) Possums eat all snakes they find including copperheads, so leave the possums alone. Never knew about the cucumber smell! Good to know! Thanks for all of your dedicated experience and taking care of so many people in your life. They definitely have my appreciation. This afternoon LPPD Sergeant Robert Bagley and Fire Prevention Officer Tommy Swann, La Plata Volunteer Fire Department, Inc., met with staff and residences of La Plata Manor Apartments to discuss a variety of safety topics. Some of the topics discussed included how law enforcement and fire and rescue handle incidents in a senior community, when to evacuate and when to shelter in place, fire evacuations, severe weather response, other natural disasters, gas leaks, active shooter, suspicious packages, as well as fraud and phone scams. Proud to be part of La Plata! Please be prepared for storms this afternoon and evening. Secure items outdoors and prepare for possible power outages.NEW! We are expecting similar stuff! A Connecticut baseball field was doused with 24 gallons of gasoline and set on fire Saturday in an attempt to dry out the field in time for a high school game. Whose idea was this? Curly's, Larry's or Moe's? A family including two children are going to be okay after a morning house fire. Dedicated to all of the men and women staffing our Nation's PSAPs. Are your children's car seats properly installed and secure? Here are a few dates and locations for Car Seat Events in the greater Southern Maryland area. By appointment only. MISSING WOMAN LOCATED!!! Thank you for sharing. UPDATE 2 p.m.: Ms. Fleet was LOCATED by officers a few minutes ago. She is safe and will be reunited with her family. No further details at this time. Thank you for all of your help. UPDATE: March 10 at 12:40 p.m.: We are still searching for Ms. Fleet. We have received additional photos from her family. Please take a look and continue sharing. Thank you. UPDATE March 10 at 10 a.m.: Officers continue to search for Ms Fleet. They have been going door to door to homes and businesses in the area and beyond. They have used infra-red devices in the wooded areas and continue to search using K9s. We have learned Ms Fleet is familiar with parts of St. Mary’s County and in particular Lexington Park. Please continue to be on the lookout for her.